It’s not that I need more kid-friendly project ideas from magazines, web sites and blogs, I just need a filter for them. Thanks to Nana, who applies an eagle eye and information sorting ability, the best ideas percolate to the top. The filter measures: 1. Will it make life or daily tasks more functional, manageable or organized? 2. Does it provide for learning or offer pure enjoyment? 3. Is it affordable? 4. Can it be done in an afternoon or reasonable amount of time? When Nana came for a visit recently with a page ripped right from the latest issue of Disney’s Family Fun magazine, I knew she meant business. It started with a pitch to my 6-yr-old son, Calvin, about the idea. 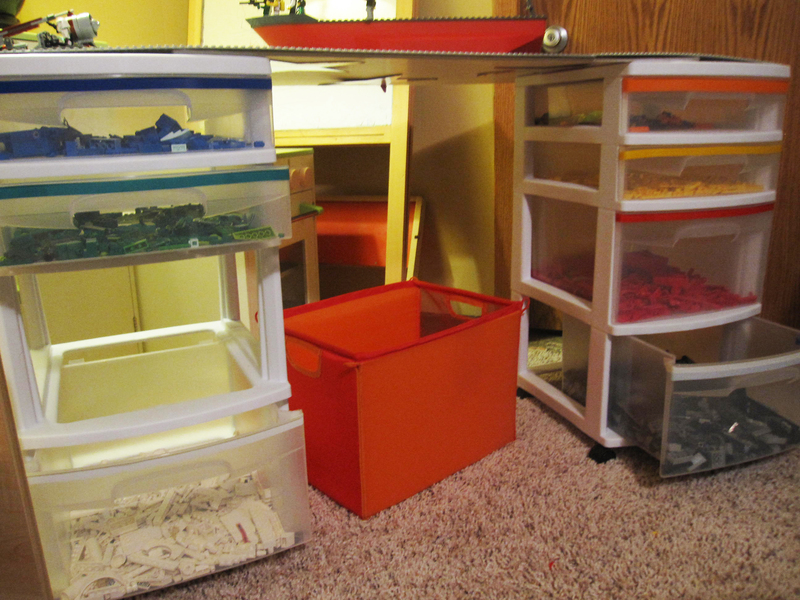 Would he like to create a table that housed his thousands of Lego parts by color, topped off by large working board for building and displaying his Lego creations? Silly Nana, of course, Yes! 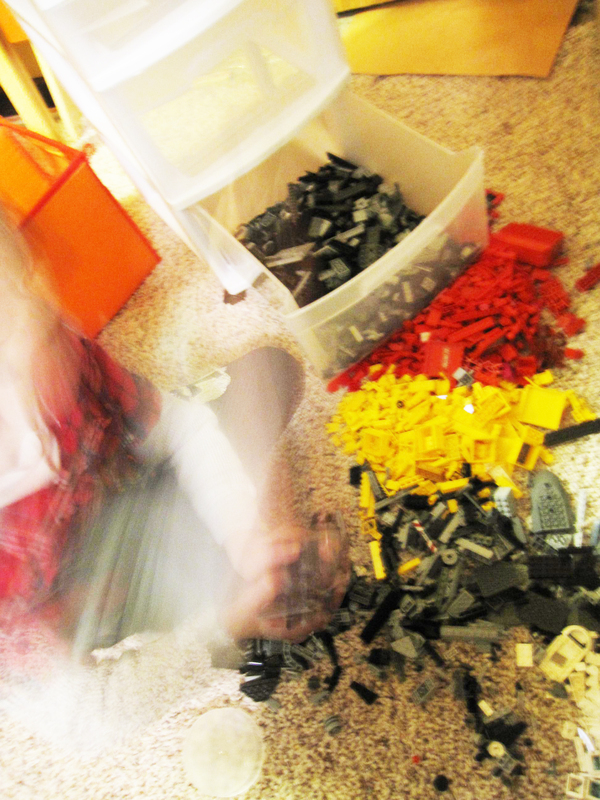 I seconded the motion that landed all of the lego parts in a huge pile in the middle of the floor for sorting. Super-time consuming Step 1 took 3-5 sorters working for 2-3 hours each. Luckily we also had the help of the Lego separator tool – saves on the teeth. This was more involved than one afternoon. With sorting complete from the day prior, we were ready to shop for the clear drawer carts. We started at The Container Store which proved pricey (about 4 times the price of the product we eventually ended up with) and not quite the right size, yet full of pre-packaged Lego-branded solutions and containers. The yellow Lego head jars were $20. Cute, but only plastic. We also checked out Bed, Bath and Beyond with no luck. Surprisingly, we walked into our next prospect, Home Depot, went directly to the storage aisle and found 2 four-drawer carts with casters that were the near-perfect size at a very right price ($17 each). Dare we venture into the electrical aisle to find electrical tape? Yes, there it was. We picked up a 5 pack of white, blue, green, red and yellow (on the narrow side) and a wider roll of orange ($8 total). We bypassed the black and brown options. The tape was for labeling the legos by drawer. A step not to be skipped. A few other errands sprinkled into the search made for a 3-hour outing and as expected, Calvin was eagerly anticipating our return and those perfect drawers for his Legos. We got started immediately, selecting from the 4 large and 4 small drawers for colors. Black and grey were together- – so many of these (due to StarWars Lego sets) that they warranted a large drawer. White, red and the accessories (wheels, etc) took up the remaining 3 large; while brown/tan/orange, yellow, blue and green filled the four small drawers. We also bought four small tray dividers at Target to place in the drawers ($14 total) for the ultra small pieces. Calvin put all of the eletrical tape on – it was very forgiving and we lifted it up a few times to get the lines as straight as possible. The next step will be to take the 3 gray flat lego boards (purchased at Lego MOA the day prior at $14 each) and attach them via bluedot to a white melemime board (in the meantime a makeshift foam core board is standing in). The board (most likely a trip to Home Depot for Papa this week) will be reversable with a non-stick skid-proof paper attached to drawer cart tops to hold it all safely in place. To replicate the chair in the magazine photo, a mod-looking one with silver legs and a bright-orange seat, we’ll be making a trip to IKEA with high hopes. The only remaining add I can think of not covered in the Family Fun feature is a place/stand to hold the instructions for the current project being work on. After all, we went to great lengths to archive the box covers and instructions in two 3-inch binders. 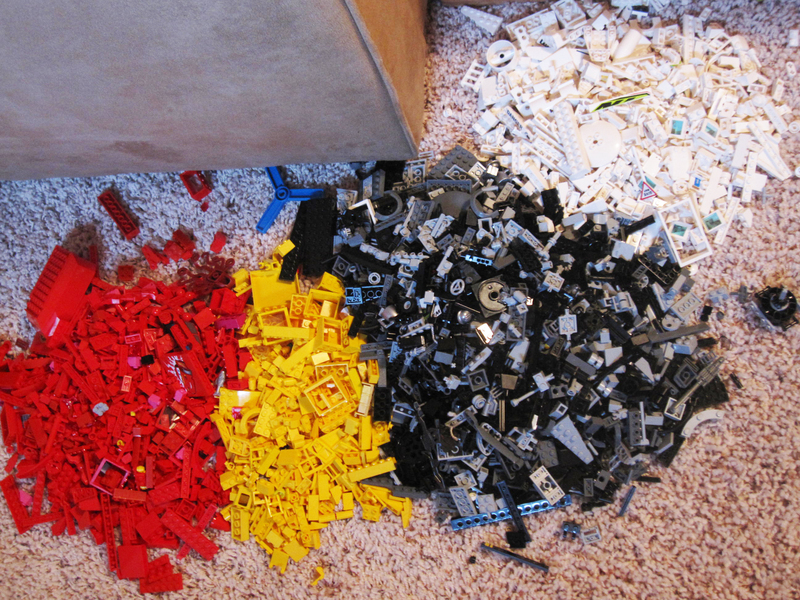 Are we finally organized Lego-wise? $98 dollars later (plus $12 for a board and $20 for the chair we have yet to add), I’d say it was worth the effort. Anything to keep the Legos contained and out of my vacuum cleaner. It’s quite a production to plan a field trip for students. So it’s fitting, during this week of giving thanks, to thank teachers at our schools for planning these outings that enrich and expose students to the world beyond the classroom. 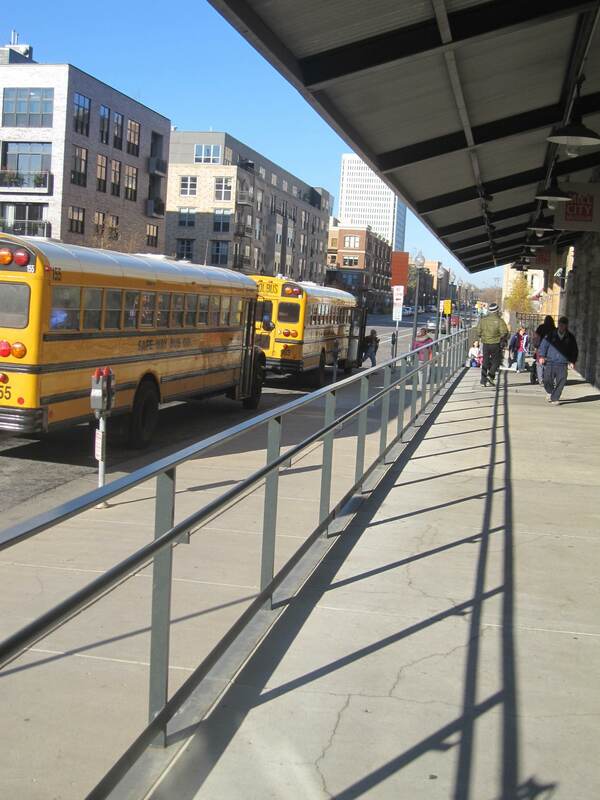 My daughter’s third grade class arrived by bus at the Mill City Museum in downtown Minneapolis on a crisp Fall day. The parents who agreed to chaperone showed up in significant numbers too in order to meet the highly suggested one parent to four students tour ratio. 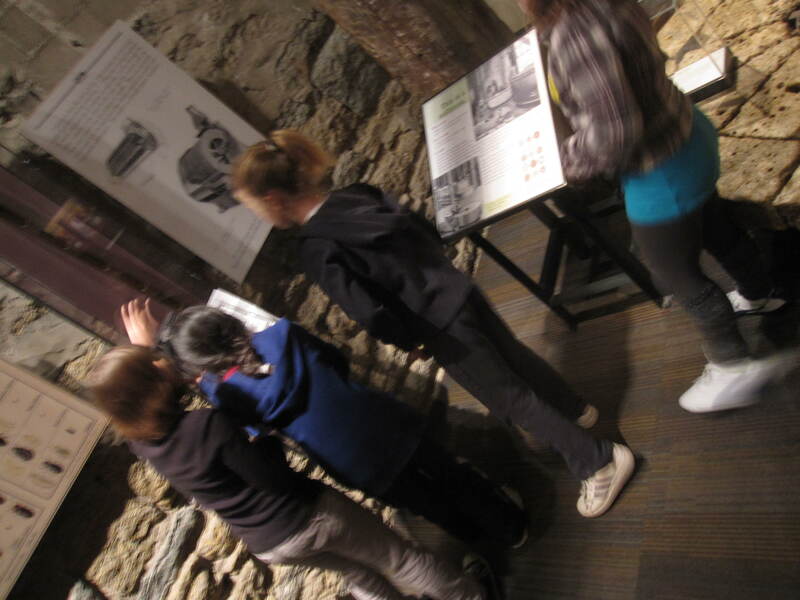 We met at 9:45 and the kids and parents filed into the museum and gathered to assemble our groups and review the rules. We go over the acronym WARN: Walk (no running! ), Adult (stay with your assigned Adult), Respect (for the museum and its artifacts) and No (no food, drink, pens). The kids and adults alike get green and orange neon colored stickers to wear as nametags. I have a squirrely group of four girls including my daughter, Ava. We are one of nearly 50 small groups at the museum today. We move through five activity areas throughout the tour. We start out in the kitchen. After thoroughly washing hands, kids head in their small groups based on the role they’ll have in the education of flour. There are farmers, millers, elevator operators, bakers and grocers. If kids need a reminder, their white hats indicate their assigned role. 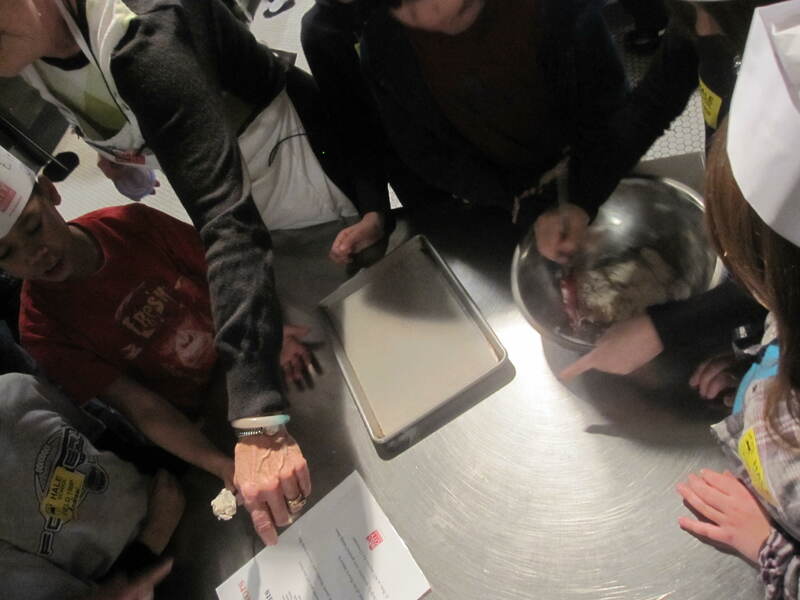 Each table makes drop biscuits and learns how to operate a spoonula and pastry blender. There is flour, baking soda, salt, butter and buttermilk in the recipe that yield eight very uneven biscuits. The baker whisks them away once they’re oven ready. 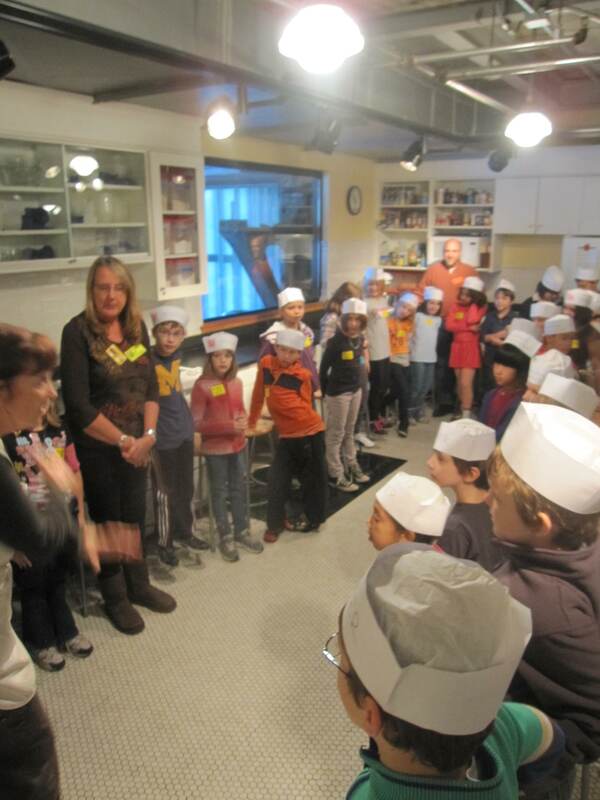 While they bake, the kids gather in their groups and the museum baker takes them through the process according to sets of props. The kids line up and take each prop around the circle so the group can view them. This holds their attention. At the completion of the interactive lesson, they happily eat their biscuits. We then move on to the water area that shows the power of water through pressurized tubes and mini Mill City models that allow small wooden pieces to move through the Mighty Mississippi. It gets crazy loud in here. We last 12 minutes. We now have our student and chaperone versions of scavenger hunts for the main museum. The girls have time to find seven items based on the picture clues and answer three questions per item. They went for the Pillsbury Doughboy first, of course. The tower is our next activity. The elevator all 40 of us fit into is stadium seating. Some kids worry about getting sick. 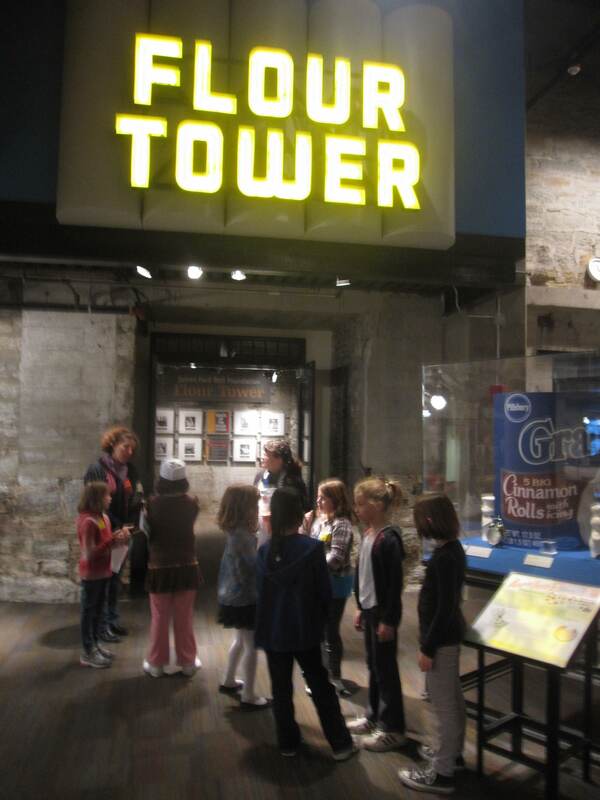 The tower tour operator explains that we’ll feel some vibrations and move through eight floors – up, down, up, down and finally back up to the observation area. The lights dim and gates close while the story of flour complete with mill workers voiceovers and holograms that show us the history of the mill. The kids are captivated. We exit and spend time discussing the massive amount of flour dust the process creates. We learn that the dust is more explosive than dynamite and upon a rebuild in 1880, new sifter-type funnels helped contain the dust and made the mill safer. Next, we head up to the observation deck with an indoor and outdoor area offering great views of the Mississippi. Ten minutes later, we go back to the main floor via a glass elevator. It’s time for lunch. I wiggle my way into a seat at the table and take the opportunity to relate to the world of a third-grader. Fascinating stuff. Lastly, it’s time for the 19 minute movie on Minneapolis. Even though we’d been to the museum before in June, Ava and I hadn’t seen this feature. It was informative, historical and insightful. Again, it held the kids’ attention. By now it’s 12:55 and time for the kids to catch the 1:00 bus back to school. I was so thankful I made the time to spend the morning with them. A bonus: my daughter enjoyed hanging out with me and didn’t give me the cold, embarrassing shoulder. Twinkle, Twinkle Little Star… my 6-yr-old son Calvin pounded out on the piano. My 8-yr-old daughter, Ava, chimed in too with her version of Chopsticks. Over the dueling pianos, my husband and I tried to have an informative conversation about used pianos. 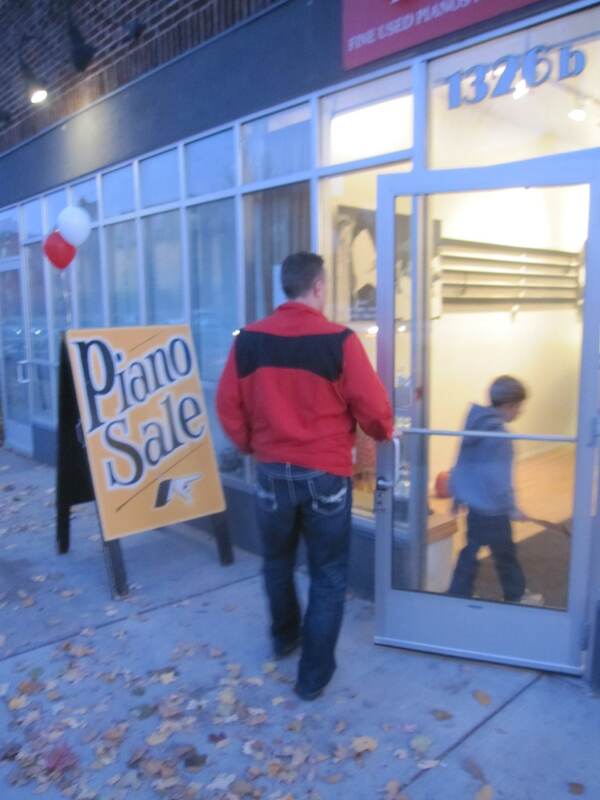 We were at the used piano shop, Keys 4 Kids, on Grand Avenue in St. Paul. I took lessons growing up – first through fifth grade. Piano went by the wayside in favor of the flute. I knew there was no possible way to manage both. I couldn’t even complete my required piano practice. Lessons were sure convenient though. I could run to our next door neighbor’s house in 30 seconds where my teacher, Mrs. Sanner, lived. I had never actually shopped for a piano. My husband knows a thing or two about music though. He also took piano lessons and went on to play the trombone and guitar. He at least has as ear to determine piano tunedness. We had started the discussion about piano a mere nine months ago. We were just now ready to take action. There had to be some proof of interest on the kids' part. They played at their great Aunt's home over the summer, our next door neighbor in Minneapolis spent some time with them, and they listened intently to their older cousin play for them. Okay, so they're ready we agreed. We considered an electric keyboar for quite awhile. I just wasn’t sold on the idea. Finally my husband agreed – it was time to go the authentic route. 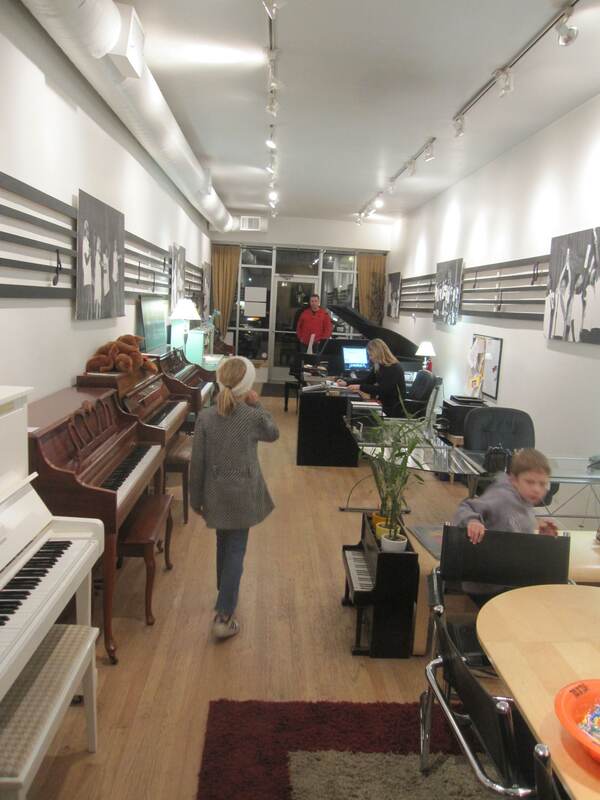 Some quick research directed us to Keys for Kids where people donate their pianos and Keys repairs and tunes them up to resell them for $99 – $699 and up. 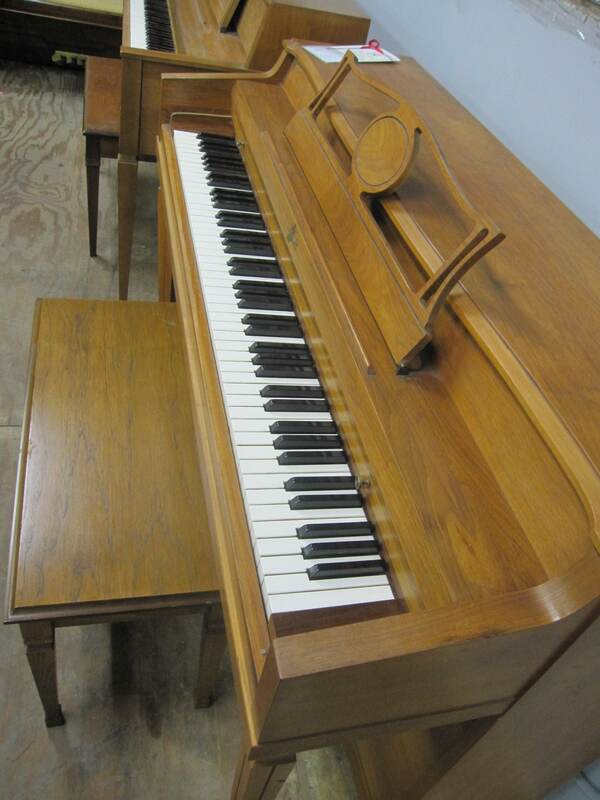 At Keys we discovered a front office, backroom and way backroom filled with pianos of all types – spinet or console, upright or grand. 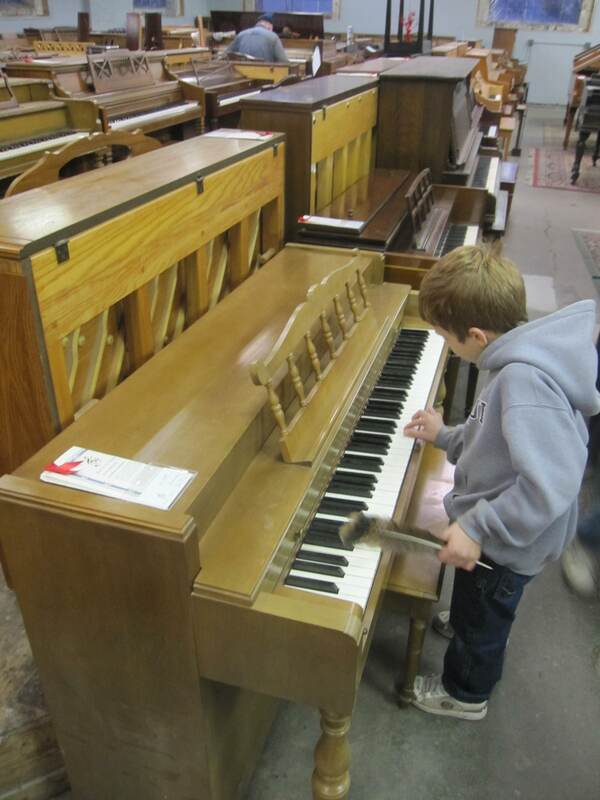 The tuner worked on one as the kids naughtily ran up and down the aisles of pianos running their fingers over them. We took him away from his fine-tuning to get his review of two that were in play for us to purchase. Both had their own history and were quite reasonable in price (Keys also delivers and tunes in your home). The salesperson encouraged us to put a deposit down if we were serious then they’d hold it for a week, which we did. She also said to take some measurements, pictures and time to think about the options. We left feeling pretty accomplished. I’d be happy with either – a Cable or Wurlitzer – no matter to me. Would it get its due of small fingers diligently learning their scales? Would it sit in the family room long after they’d progressed to other instruments? I have high hopes. Especially now that the other piece – lessons at the Music Lab – is falling into place. I like that the Lab doesn’t do recitals (the kids just play at some local coffee shops ocassionally) and they bring a group of kids together to have jam sessions. It seems to be about keeping it interesting, finding alternate ways to keep them learning and showing them some inspiration – like having them listen to modern music they actually like and playing a paired down version or a melody. I recall setting my timer for 30 minutes and going through the motions of certain songs and rewarding myself with Nadia’s Theme or Tearms of Endearment if boredom threatened. I hope it can keep their interest. It remains to be seen. My question for parents is this: Along with the desire to expose our children to everything possible – sports, art, language, clubs and the like – decisions to join or not to join enter in. Where does the importance of music lessons fall on your scale?